The Taj Mahal is considered as one of the seven wonders of the world. An architectural wonder, this beautiful monument is regularly visited by tourists and locals alike and is a testament of love, grief, and longing. It is not just popular because of its magnificence and scale, but also for the deep and rich history behind it. The Taj Mahal is, in reality, a shrine that an emperor constructed for the love of his life to be able to bury her underneath it, as a testament of his love and adoration for her. Shah Jahan was an emperor of the Mughal dynasty that ruled over India from the 16th to 18th century. He had three wives, as was the norm back then for Muslim men, but his favorite was the Queen Arjumand Banu Begum, better known as Mumtaz Mahal. Mumtaz Mahal’s name loosely translates to the “chosen one of the palace.” Indeed, she was the one queen Shah Jahan doted on and adored far more than his other two wives, because she had a strong character and incredible beauty, and she showed no regard for his property and riches in spite of being a Queen herself. She won his heart through her incredible strength of character. She was a Persian princess, who was brought to India after marriage. They met when Shah Jahan was only 14 years old, and he was instantly smitten by her, and they married after 5 long years. She bore Shah Jahan fourteen children, but during the childbirth of the last child, passed away from childbirth trauma. Shah Jahan was beside himself with grief. Known for commissioning a large number of mausoleums and monuments across India, he ordered his men to construct the most beautiful mausoleum for his lost love across the other bank of the Yamuna river. The chief architect that was commissioned to overlook everything was Ustad Ahmad Lahouri, an Indian of Persian descent. He later also oversaw the construction of the Red Fort. Construction was started immediately in 1632 and took the next two decades to finish. Over 20,000 workers from India, modern day Pakistan, Persia, and Europe were brought in to start construction along with over a thousand elephants. The workers comprised of artisans, laborers, carvers, masons, stone-cutters, calligraphers and dome-builders. It took 32 million rupees to construct. The monument was named the Taj Mahal after Mumtaz Mahal and consists of a central dome that rises to 73 meters and four slender minarets at four corners. Inside the mausoleum, a marble chamber adorned with semi-precious stones and carvings housed the cenotaph of Mumtaz Mahal. The real sarcophagus lies below it, underneath the ground. 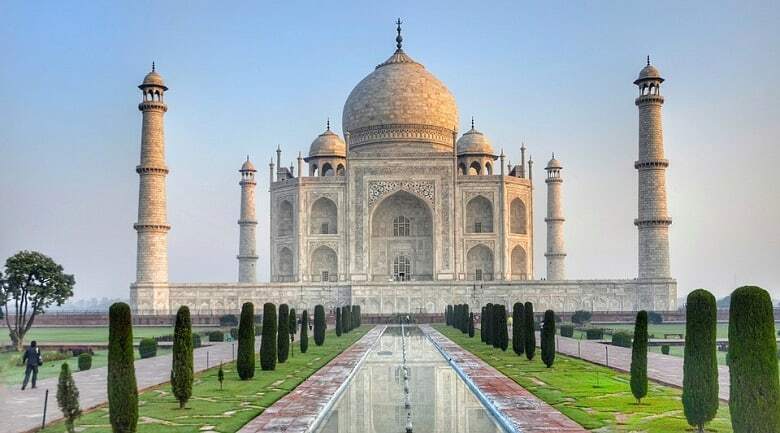 Shah Jahan intended to build a second mausoleum for himself, so that he may be buried next to Mumtaz Mahal, connected by a bridge. However, he was deposed in 1658 by Aurangzeb and placed under house arrest at the Red Fort, from where he spent the remainder of his days looking out through the window at the Taj Mahal, reminiscing about his lady love and waiting for the day they would be reunited in paradise.